On May 5, 1949, two F-47N fighter planes of the Connecticut Air National Guard took off from Bradley Field for a training flight. 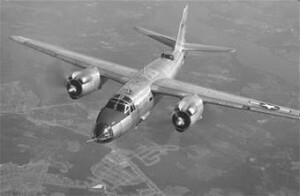 One aircraft, (#44-89346) was piloted by 1st Lt. Marshall J. O’Quinn, 30, and the other by Lt. Russell B. Elliott. 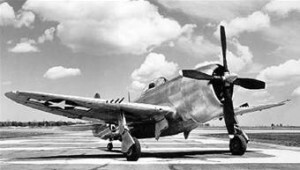 The F-47 was the designation given to the former P-47 Thunderbolt used extensively by the allies during World War II. By 1949 they had been relegated to National Guard units. At about 6:00 p.m., Lieutenant’s O’Quinn and Elliott were flying at 3,000 feet about 2 miles due west of Talcott Mountain, heading north. Lt. Elliott was leading with Lt. O’Quinn on his left wing. At this time Lt. Elliott made a 180 degree turn and began heading south, while Lt. O’Quinn turned east towards Bradley Filed. Lt. O’Quinn’s radio had stopped working about five minutes earlier, and believing he was returning to Bradley due to some other malfunction with the airplane, Lt. Elliott turned to follow. The airplanes passed over Heublein Tower atop Talcott Mountain with Lt. Elliott trailing and continued in a northeast direction. Then Lt. O’Quinn made a shallow 360 degree turn at an altitude between 1,500 and 2,000 feet. After completion of the turn, he climbed to 3,000 feet and rolled the F-47 on its back and went into a split-S maneuver pulling streamers from each wingtip. Lt. Elliott watched as Lt. Quinn’s aircraft dove all the way down then level off just before it crashed. Lt. O’Quinn was killed instantly. Lt. O’Quinn was a veteran of WWII, and received his pilot’s wings on April 15, 1945. At the time of his accident he was assigned to the 118th Fighter Squadron, 103rd Fighter Group, 67th Fighter Wing, of the 1st Air Force. He’s buried in East Cemetery in Manchester, Connecticut, in the veteran’s section. To view a photo of his grave, go to www.findagrave.com and see Memorial # 1374190.